Wellington runner Paul Hewitson started this morning’s final 28 kilometre stage from Peaks Road in North Otago to Oamaru six minutes behind Jason Rawlings from the UK with a combined time of 29 hours and 30 minutes. Keen to close the gap Hewitson set a hectic pace that both Rawlings and men’s supported leader Englishman Keith Burrows struggled to hold, eventually storming home in the day’s fastest time of two hours and four minutes to claim second, finishing the event only four minutes ahead of Rawlings after seven stages and 323 kilometres of racing in a time of 31 hours and 34 minutes. Burrows ran the day’s second fastest final stage coming home three minutes after Hewitson to hold onto his men’s supported lead with an overall combined time of 30 hours and 44 minutes, 50 minutes ahead of Hewitson. In a close battle in the women’s unsupported event where runners have to carry their clothing, food and sleeping bags, Queensland runner Sarah Foster finished the final stage six minutes ahead Emily Kratz from the United States but Kratz held onto her overall lead, winning the event with a time of 37 hours and two minutes, 18 minutes clear of Foster. Kiwi Jamie Stevenson was third in the women’s unsupported event, three hours and 14 minutes behind Foster. With a combined time of 35 hours Australian Katy Anderson won the women’s supported event by one hour and seven minutes from New Zealander Kelly Sutherland, and was an impressive fourth overall while Sutherland was seventh. Canadian Maude Ruest was third, four hours and eight minutes behind Sutherland. The men’s unsupported race was won by former US Special Operations Ranger Seth Campbell who now lives in New Zealand with a time of 35 hours and 18 minutes, 46 minutes ahead of Tim Franklin from Australia. KIwi Mark Cross rounded out the top three finishing one hour nine minutes behind Franklin. The Anchor Milk Otago Alps to Ocean Ultra started at Mt Cook on Sunday with 120 competitors from 14 countries with 98 making it to the finish line in Oamaru. Photo credit KRISTY LIND DESIGN: Englishman Keith Burrows crosses the Anchor Milk Otago Alps 2 Ocean Ultra finish line in Oamaru, the quickest to complete the event, winning the men’s supported event in 30 hours and 44 minutes. North Otago’s 67 year old Eric Ross held off the leaders to be first home on the toughest stage of the Anchor Milk Otago Alps 2 Ocean Ultra, a gruelling 88 kilometres from the shores of Lake Ohau to Loch Laird beside the Waitaki Lakes. Ross knows the area well having had a hand in the course design of the 323 kilometre seven stage ultra-running event, and put his local knowledge to good use holding off the event’s leaders after starting two hours earlier yesterday morning, finishing the Queen stage of the event 12 hours and four minutes later. Ross now lies seventh in the men’s supported category, his combined time after four stages of twenty three hours and forty nine minutes, four hours and 48 minutes behind leader Englishman Keith Burrows who has a 41 minute lead over Jason Rawlings while Wellington runner Paul Hewitson lies third. The gruelling race defining 88 kilometre stage included two tough climbs of over 800 metres that as well as testing the runners provided some magnificent scenic views as runners took between just over 10 hours to more than 19 hours to complete the route. In the closest battle in the event Emily Kratz from the United States took over the lead from Queensland runner Sarah Foster in the women’s unsupported event where runners have to carry their clothing, food and sleeping bags, completing the stage in 11 hours and 28 minutes, 17 minutes quicker than Foster. Kratz now has a combined time of 22 hours and 40 minutes, only three minutes ahead of Foster with three days of racing left. Men’s unsupported leader Canadian Chris Coolican pulled out with an injured hip and calf during the fourth stage that saw Seth Campbell take the lead in the unsupported category. Campbell, a former US Special Operations Ranger, takes a 46 minute lead over Tim Franklin from Australia heading into the final three stages. With a combined time of 21 hours and six minutes experienced ultra runner Australian Katy Anderson leads the women’s supported event by one hour and 32 minutes from Kiwi Kelly Sutherland. Anderson lies fourth overall while Sutherland is seventh. Tomorrow’s stage five is a shorter punchy 45 kilometres that starts at Loch Laird and heads down the Waitaki River Valley. Englishman Keith Burrows stormed home 55 minutes quicker than last year’s winning time on the on the second day of the Anchor Milk Otago Alps 2 Ocean Ultra to consolidate his lead in the men’s supported category of New Zealand’s only stage race ultra-running event. The event started on Sunday in wet and windy conditions with 120 runners from 15 countries and after seven stages over seven days and 323 kilometres it will finish in Oamaru on Saturday. Today’s 50 kilometre stage took runners from Lake Pukaki to the secluded Lake Middleton that sits next to Lake Ohau in the Mackenzie Basin. With the improving weather matching the improving times Burrows has a combined time of eight hours and 49 minutes after two days and three stages to lead Wellington runner Paul Hewitson by 11 minutes heading into tomorrow’s gruelling race defining 88 kilometre Queen stage that’s starts on the shores of lake Ohau and ends at Loch Laird at the top of the Waitaki Valley after two tough climbs of over 800 metres. “I did see the times from last year, but didn’t know exactly what the terrain was like, but thought I could be up there and be competitive,” Burrows, who is tackling his first ultra-race stage race event, said. Chris Coolican from Canada stills leads the men’s unsupported event, where runners have to carry their clothing and sleeping bags, by 14 minutes after losing five minutes on today’s stage to good mate, Tim Franklin from Australia, as he struggled with a hip and calf strain. With a combined time of 10 hours and nine minutes Katy Anderson leads the women’s supported event from Kiwi’s Kerryn Bell and Kelly Sutherland who are locked together 39 minutes behind the experienced Australian ultra-runner. Queensland runner Sarah Foster has been the first unsupported women home on both days so far, with her combined time of 10 hours and 58 minutes giving her a 14 minute buffer over Emily Kratz from the United States heading into tomorrow’s toughest stage of the week. First across the line today in the Anchor Milk Otago Alps 2 Ocean Ultra (Left to right) Keith Burrows (supported), Katy Anderson (supported and Tim Franklin (unsupported). Running in the supported event Australian James Kohler and Bell were the first male and female runners to cross the finish line on the shores of Lake Ohau on the second day of last year’s Anchor Milk Otago Alps 2 Ocean Ultra, and both continued to lead until injury struck Bell on stage five of the event and she was reduced to walking to complete the event. With a young family it had been almost 10 years since Bell, a former ironman competitor and New Zealand representative in triathlon, had done any serious training or racing when she ran in last year’s event. But Bell cannot wait for this year’s Anchor Milk Otago Alps 2 Ocean Ultra to get underway again, quick to say she that even though she injured her achilles and had to hobble almost 100 kilometres spread over two days to get to the finish line with the aid of walking sticks last year, just fell in love with ultra-running. After having two children and almost 10 years away from sport Bell turned 40 last year and needing a goal saw an advertisement for the Alps 2 Ocean Ultra and entered the next day with no idea what was involved or how she would manage to do it. “I’d just had surgery for neuromas on both feet and was crawling around on my hands and knees unable to walk, so the Alps 2 Ocean was a good goal to get motivated and run again,” Bell said. So training fits around the family and work with most of her training done after the kids are in bed at 8pm or if her husband is away Bell takes the kids with her. The Anchor Milk Otago Alps 2 Ocean Ultra starts in the shadow of Mt Cook at 7am this Sunday and finishes a week later in Oamaru in North Otago, travelling through some of New Zealand’s most spectacular alpine scenery. Photo credit: Kristy Lind Design/Alps 2 Ocean Ultra; Queenstown ultra-runner Kerryn Bell - pictured finishing last years event - can’t wait to race again in this year’s Anchor Milk Otago Alps 2 Ocean Ultra after last year saw her injured while in the lead with two stages left. After knocking off four of the world’s most treacherous deserts, 24-year-old ultramarathon runner Jacqui Bell from Brisbane Australia is in New Zealand with her sights set on being the youngest person in history to run an ultra-marathon on every continent in the world. After last year being crowned the youngest female ever to undertake the four desert ultra-running event challenge in one calendar year Bell will be one of the 120 competitors lining up this Sunday to run in the Anchor Milk Otago Alps 2 Ocean Ultra that starts at Mt Cook and finishes 323 kilometres and one week later in Oamaru in North Otago. Bell successfully ran gruelling 250 kilometre ultra-events in Namibia, the world’s oldest desert located in southwest Africa, the Gobi Desert in Mongolia, the Atacama Desert in Chile and finally Antarctica, in the process ticking off four of the world’s seven continents. 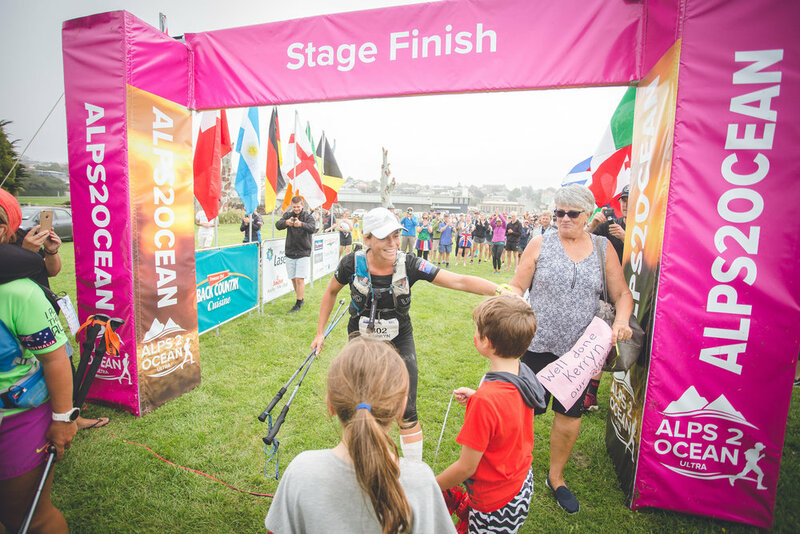 The Anchor Milk Otago Alps 2 Ocean Ultra will be her longest race yet, and it will be followed by ultra-events in Iceland and then the Grand Canyon in the United States to cap off an ultra-marathon on every continent in the world. Throughout her young life she has battled with mental health experiencing first-hand what it is like to feel insecure, helpless and make emotionally-charged mistakes saying that before taking on running more seriously she was battling many inner demons eventually turning to running to clear her mind, not knowing it would change her life. In 2015 Bell, who works in the fitness industry as a personal trainer, discovered a newfound passion for running and started competing signing up for her first 50 kilometre ultramarathon event aged just 20. She was hooked and then ran in every ultra-event she could until her ambition saw her conquer the four deserts challenge, and now is focused on being the youngest person in history to run an ultra-marathon on every continent in the world. Not only was Bell working hard on the trails and in the gym but while competing last year she raised over $17,000 for mental health charity the White Cloud Foundation. She has built strong partnerships with some well-known brands that include Jaybird and Flight Centre, acknowledging that without their support she would not be able to do pursue her ultra-running dreams. The Anchor Milk Otago Alps 2 Ocean Ultra has attracted competitors from 14 overseas countries with overseas competitors making up almost two-thirds of the 120 entries. There are 46 New Zealanders racing along with 34 Australians and nine competitors from the United States and Canada. Other countries represented are England, Scotland, Ireland, Brazil, Estonia, France, Germany, Italy, Switzerland and Tonga. Photo credit: Thiago diz. Racing in Antarctica saw Australian Jacqui Bell knock off her fourth continent in her bid to become the youngest person in history to run an ultra-marathon on every continent in the world. Alexandre Lucas and Vincent Hulin of France running through the Mackenzie District with Aoraki/Mt Cook in the background. They were the winners of last year's team race.